Last updated: September 22, 2009 at 11:49 am. 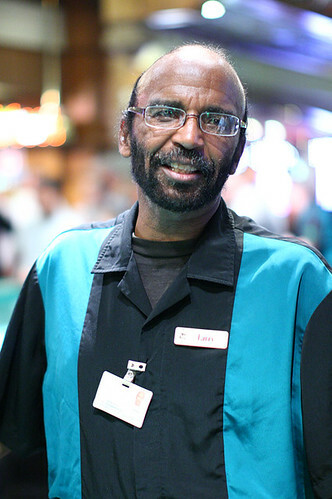 Posted Thursday, September 10, 2009 by Las Vegas Blog Staff in Gaming, O'Sheas. Comments Off on The Best Bet in the Casino. Larry wanted to do stand-up. And as a craps dealer, you stand up A LOT. We get the feeling Larry gets that question a lot. Bonus craps fact: By playing just $1 on the “hard six” or “hard eight” (those numbers have to come as a pair before an “easy” six or eight, and before a seven), you can turn your $1 bet into $1,000 just by letting it ride three times. Hit a pair of threes once, and $1 wins $10. Hit the hard six again, and it’s $100. One more time, and it’s $1,000. When it happens, don’t forget to give a little love to Larry.